Anyone who has been pregnant knows that the moment you announce you’re expecting, people will give you plenty of “helpful” tips on how to cope with pregnancy, how you should deliver the baby, and that you should “Sleep when the baby sleeps” or “It’s the best time of your life!” While it may be true that it is a wonderful time, it is also a time of exhaustion, confusion and crazy hormones. Welcome to motherhood! We’ve all heard of ‘nesting’. Some people don’t get it (my husband was most disappointed when I didn’t!) If you do experience nesting, make the most of it. Go on a cooking frenzy and stock your freezer. Easy meals to reheat, baked goods and even simple sandwiches will help you out when you’re starving and too tired to comprehend whats for dinner. If you don’t have the freezer space (or the inclination to make dozens of portions of lasagna), write-up some meal plans. Have a go-to list of meals that take little to no preparation. Remove as much of the thought and pressure required to make delicious and nutritious meals so that it’s not as daunting facing down the oven when you can barely manage to shower yourself. Stock the cupboard with tins of baked beans, if it comes to that. A full belly is what counts at this stage however you achieve it. If somebody wants to come and help out, let them do it. There are no prizes for doing it on your own, and there’s a reason the saying “It takes a village to raise a child” is so popular. Let somebody come over to hold the baby while you shower. Better yet, have them put the baby down for a nap and then do a load of washing for you. Don’t feel guilty for accepting help. They want to help and will feel good for doing so. If you already have a child, you’ll be familiar with the newborn haze. But you’ll be facing a new challenge this time around – how will I care for my older child while caring for the baby? Will they cope with the new arrival? One popular idea is to have the baby bring a present for their older sibling. Have it there when they meet for the first time. Depending on the age of the older child, a new doll is a great idea. They’ll have their very own ‘baby’ to look after. They can change nappies, ‘feed’ their babies, and burp them. Having them do that while you feed your baby is a nice way of keeping them simultaneously involved and entertained. Busy bags are another nice idea – fill a bag or box with special toys and snacks that only come out when you need a bit of time (like during feeding). Colouring books, puzzles, kinetic sand, and a new DVD are just a few suggestions to put in their bag. The novelty of these bags may help keep them focused on that, and not on trying to win your attention from their needy new sibling. There are so many books, on many and varied topics, out there on how to care for a baby. It’s a great idea to look at a few (if you don’t want to buy them, your local library should have copies of the more popular books), but keep in mind that these books are written with no particular baby in mind. You need to read them with one very particular baby in mind – yours! If a routine is important to you, soak up the knowledge on how to make a workable routine, but remember that it’s okay to tweak it to suit you. You don’t have to follow everything they say, and you don’t need to feel guilty if their advice doesn’t work for you. Your baby didn’t read the same book (haha! ), so it’s forgivable that they don’t follow that advice. Take bits of advice from everywhere – books, family and friends, parenting websites, those helpful strangers in the supermarket line who tell you exactly how you should be parenting. It’s okay to ignore everyone (especially the strangers!) but you can take bits and pieces of their advice and create your own routine. You’re the one who has to live it every day, so there’s no point following a routine that doesn’t sit 100% right with you, simply because a parenting expert suggested it. This may sound like a fairly obvious tip, but it’s a big one. Recognising your baby’s tired signs will make a world of difference! Getting your baby to nap on time will prevent them from becoming overtired, which leads to them (and possibly you) being grizzly, demanding, and harder to settle. Some tired signs are easy to spot – yawning, rubbing eyes, fluttering eyelids. Some aren’t as easy to spot – pulling at ears, reddened eyebrows, and jerky leg and arm movements can be signs that your baby is ready to nap. Your baby may show just one sign, or they may show a few. Keep an eye out for them, but remember, learning them could take time – you two are still getting to know each other. 6. Ace that tummy time! Tummy time is something that is often talked about, and stressed as being of great importance, when it comes to newborns. Tummy time helps a baby gain strength, push up from their belly, and eventually begin rolling, sitting up, crawling and standing. Something that isn’t mentioned as often is just how many babies hate tummy time. 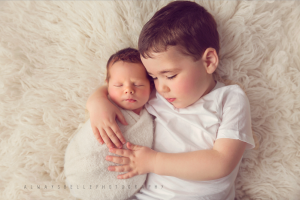 I had four babies who hated it and, between our team of health professionals, was able to gather a number of tips that helped them enjoy it more, and helped ease my Mummy guilt on the matter. Give your baby something to look at and play with during tummy time. Babbling to their favourite toy, themselves in a mirror, or even Mummy can distract them from the torment of tummy time. And it’s a lovely way for some face to face time for Mummy and baby. Mix up the location of their tummy time. A playmat on the floor is far from the only place for tummy time. Something many babies love to do is lay on a parent’s chest. They’ll still be in tummy time position, but with the added benefit of having cuddles. Laying your baby across your lap provides yet another new perspective, and you can gently sway your legs (with a hand on baby’s back to keep them safe) to provide some extra comfort. Propping a baby up, especially refluxy babies, can help out with tummy time. A rolled up towel or blanket under their chest, with their arms in front of it, can give them a new perspective while easing the pain a refluxy baby may feel from lying flat on their tummy. Remember – tummy time doesn’t have to be for lengthy periods! A few minutes here or there is better than nothing. If you have any concerns, don’t hesitate to contact your health professional for further tips. Babies are constantly learning. It can be a tricky business, and intense periods of learning can leave babies more upset, demanding and fussy. The book (there’s also an app), The Wonder Weeks, helps to explain these periods. A baby going through a developmental leap is constantly learning and that can be overwhelming to them. There are many leaps, happening from as early as 5 weeks old all the way up to 75 weeks old. Having them explained, and knowing the reason for these fussy phases, can make them a bit more bearable. Even better, they give you tips on how to help your baby through each phase. It can be as simple as providing extra comfort, helping them use a new toy, or explaining things to them in simple language. If you are hesitant to buy the book or app, google them and there is lots of free information to get you started. Something that’s being talked more about is the Fourth Trimester. It’s basically the idea that the first three months of a child’s life are an extension of their time in the womb. While in the womb, your baby had their every need met before they even knew they needed it. There was no wait for food, no sore bellies full of gas, no fight for sleep, no wet nappies to contend with. Perhaps it is unrealistic to expect a baby to adjust to these massive changes anytime soon. 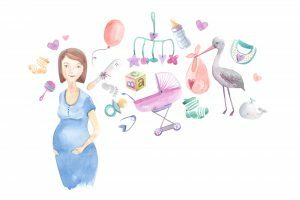 With that in mind, there is a movement towards following the rules of the fourth trimester, rather than trying to follow a strict schedule straight away. Demand feeding is one such rule. It may feel like all you are doing is feeding your baby, but think of each feed as practice. They’re slowly learning how to feed more efficiently, learning how much milk they need to fill their belly, and learning how to digest it. Another big part of living by the fourth trimester is to change your sleep expectations. It’s okay to have your baby sleep while being worn, sleep while being cuddled, and sleep while (safely!) co-sleeping. As the days progress, your baby will start to figure out their own routine and that can help you to figure out yours. Going to bed earlier or later to coincide with their biggest stretch of sleep can help you get a decent block of sleep. One way to sum up the fourth trimester is simply “You can’t spoil a newborn”. Giving in to their every whim when they’re tiny will not ruin any schedules you instil later on. Give both yourself and your baby a bit of time to adjust to this massive change. One thing to remind yourself is that they will grow up. And it’ll happen fast. Go nuts with the photos and videos – you’ll never regret immortalising those special moments. There’ll be a time, probably soon, where you’re sleeping more, finding a routine, and starting to feel normal again (albeit a new type of normal). Talk to your friends and family to get you through the tough moments, but soak up every single good moment that you can. Enjoy the amazing new relationship you have with your brand new baby. 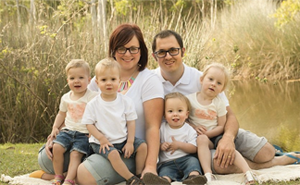 About the Author: Michelle Duncan is mother to a 3-year-old girl and 2-year-old girl-boy-boy triplets. Currently living just outside of Brisbane, she is a RAAF wife who has lived in many different towns and states over the last seven years. She studies, works part-time and in her free time (what’s free time?) loves cooking up a storm and singing loudly (badly) to 90’s pop music. You can also read Michelle’s ‘Multiples Survival Guide’ on Baby Hints & Tips. Image credit: Sarah Scott Photography.